Join the 800,000 players at LadyLuck’s and you could win a share of the millions paid out each month. Sign up here to get £2.50 in free credit. If you enjoy playing online bingo then LadyLuck’s could be the safe and reliable partner to loose your mobile bingo virginity to! They are the biggest mobile bingo brand in the world and produce some of the best quality games we have seen. 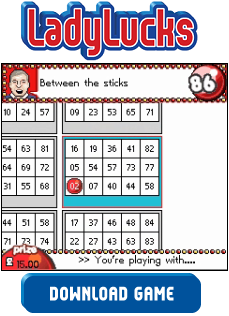 To play LadyLuck’s Mobile Bingo you simply purchase strips and enter a draw. The game will then auto-dab your numbers while you keep an eye on your best performing ticket. A new game starts every 2 minutes with a progressive jackpot, which consistently pays out at over £6,000. It is the first mobile bingo game to have an in-built, live chatroom system allowing you to have fun talking to people from all around the country. The chatroom also features regular quizzes and various competitions giving you plenty of extra opportunities to win each month. LadyLuck’s have about 18 other mobile games to play including Gem Busters & Filthy Rich Slots. Just type in your mobile number here to request the game and your account will be funded with £2.50 for free. You will also get your first deposit matched up to £100, this is excellent for trying out the other games. Lack of sound in game and no iPhone compatibility. LadyLuck’s are world leaders in mobile gambling with over 800,000 registered players and millions given away each month. So, just as we expected, LadyLuck’s mobile bingo game is one of the best out there. In short, LadyLuck’s Mobile Bingo is a must-try for any Bingo fan.